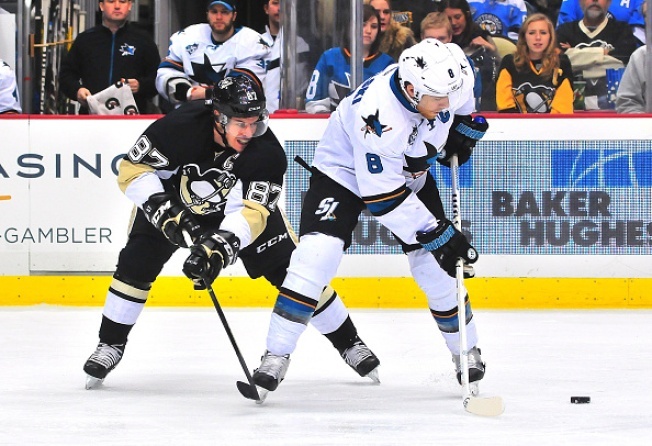 File image of Sidney Crosby #87 of the Pittsburgh Penguins with Joe Pavelski #8 of the San Jose Sharks during the game at Consol Energy Center on November 19, 2015 in Pittsburgh, Pennsylvania. San Jose Mayor Sam Liccardo today made a friendly wager with Pittsburgh Mayor William Peduto ahead of the NHL Stanley Cup Final series between the San Jose Sharks and Pittsburgh Penguins. The losing mayor will make a donation to the winning mayor’s charity of choice and take a photo wearing the captain’s jersey of the Stanley Cup Championship team the day following the final game of the series. The jersey will also be donated to the winning mayor’s charity of choice to be auctioned off as a fundraiser. Liccardo is crossing his fingers that the Sharks win, and that proceeds will go toward a nonprofit dedicated to ending homelessness, Destination: Home. If Pittsburgh loses, Peduto’s charity of choice is the Hill House Association. The puck drops for Game One of the Stanley Cup Final series in Pittsburgh Monday at 5 p.m. The Sharks will be holding a Game 1 Viewing Party at the SAP Center, and there will be a Sharks Rally taking place in Cesar Chavez Plaza starting at 2 p.m.